Arrowhead Systems Ltd of Stoke-On-Trent has partnered with NanoSatisfi on the ArduSat project. They aim to give UK school children the chance to run experiments in space. Arrowhead Systems have experimental time on Ardusat, with access to every sensor, from the Geiger counter to an open-source spectrometer (called Spectrino), strain gauges, magnetometers, vibration and shock sensors, gyroscopes and accelerometers, cameras and more. Two ArduSats are planned to launch in 2013, it is understood both will be deployed from the ISS by the JEM Small Satellite Orbital Deployer (J-SSOD) of the Japan Aerospace Exploration Agency (JAXA). 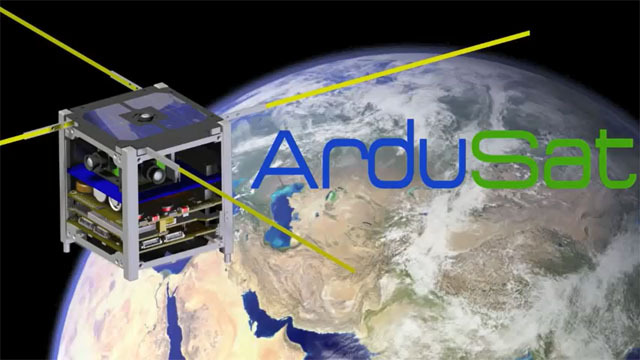 ArduSat’s are open-source arduino-based nanosatellites developed by NanoSatisfi. They will have an extensive sensor-suite onboard and will allow users to upload their own code and run their own experiments. ArduSat will use a GomSpace NanoCom U482C which is a half-duplex UHF transceiver operating in the 435-438 MHz band. It implements Forward Error Correction (FEC) and Viterbi coding based on the CCSDS standards in order to improve reliability and throughput of the space link. NanoSatisfi was founded by Austrian-born Peter Platzer a former high-energy physicist (CERN), former Hedge Fund Quantitative Trader, avid HP-41 hacker and Arduino enthusiast, along with Belgian aerospace engineer Jeroen Cappaert KK6BLQ intern at NASA Ames Research Center, Canadian aerospace engineer Joel Spark KK6ANB intern at EADS Astrium and Hungarian Reka Kovacs intern at NASA Ames Research Center working on alternative methods of public outreach for space science. The four founders met at the International Space University in Strasbourg and thought that they could do something to provide affordable, open-source space exploration for everyone. ArduSat will use a GomSpace NanoCom U482C which is a half-duplex UHF transceiver, capable of 3W, operating in the 435-438 MHz amateur radio satellite band. It implements Forward Error Correction (FEC) and Viterbi coding based on the CCSDS standards in order to improve reliability and throughput of the space link. Space Safety Magazine reports that in recent years it has become both easier and more conceivable for students and amateurs to run experiments in space. Non-governmental space organizations are on the rise, DIY spaceflight is all the rage, and it seems the web is full of videos filmed from atop weather balloons launching someone’s favorite figurine into the stratosphere. A recent project even allows consumers to use purchase points from American Express towards funding student experiments aboard the International Space Station. The magazine article focuses on NanoSatisfi who launched a Kickstarter initiative on June 15 for an open source CubeSat called ArduSat (although naming rights are available in return for a $10,000 donation).